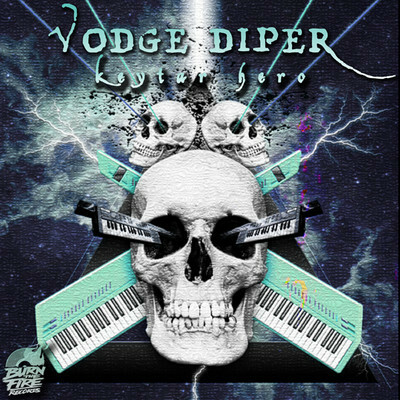 Two tracks from Mr. Vodge Diper today. Both melodic electro but the 2nd track he calls "Electro Meets Destroyer-Of-Worlds-Step" genre. It'll be dropping on July 27th so hopefully you'll all sell your children/kidneys/whatever to go buy this. Take it easy and peace. You'll be able to buy it here when available. "Only After Midnight" will be released and available Wednesday the 27th (2 days). keyboards flying out of skull eye sockets. thats metal. oh yeah, cool music too. First one wasnt working for me, so i guess i will try again later. The second one was money, i loved it. Rockin the cheese organ, it's one of my favorite virtual instruments. I really love the dubstep stuff at the end of second one personally, it's done really well and totally compliments the synth. How rad is that album cover. I want to love Vodge Diper by virtue of amazing art alone. Then turns out the music is actually pretty awesome as well. Battin' a thousand. Two awesome tracks. Awesome. Different and awesome. My ears are all melty. I think this is probably one of the most ironic and creative band names that I've ever heard. But I have to admit, I really like the sound! AWESOMENESS! I need both in my cellphone in this very moment! Holy Sh*t thats a badass cover. Their logo needs more keytars and skulls! What kind of genre's do you like to spin? Good beats on these tracks. They're REALLY good songs. I loved. Really good songs. Best on your blog so far, IMHO. Great job, mate. I danced. That's a big compliment. Nice name for a group :P Good play on words. Electro-meets--destroyer-of-worlds-step is a bit of mouthful for a genre! Both good tracks but I REALLY like the second one! Woah nice tracks, I think my speakers want to file an assalt report!